A natural coast rhythm around the winter solstice is bringing the year's highest tides to California shores, including here in San Diego. Mark Strudley of the National Weather Service (NWS) in Monterey said he expects high tidal activity through Tuesday, peaking Monday. Strudley said the so-called King Tide happens when the sun and moon align, which pulls ocean water to opposite sides of the earth and creates extremely high and low tides. NBC 7’s Whitney Southwick forecasted sets of swells 6 to 8 feet along the San Diego coast. NWS has issued a Beach Hazards Statement for San Diego through Tuesday morning, warning of strong rip currents and minor tidal overflow that could cause flooding. Get Our New iPhone App! During high tide Monday morning, waves toppled over the walkway surrounding the Children's Pool and covered the windows of the Marine Room restaurant in La Jolla. Seasoned surfers also took advantage of the tall waves. “This is a northwesterly swell, so it’s those west-facing beaches that are getting slammed today (Monday) and again tomorrow (Tuesday),” Southwick explained. 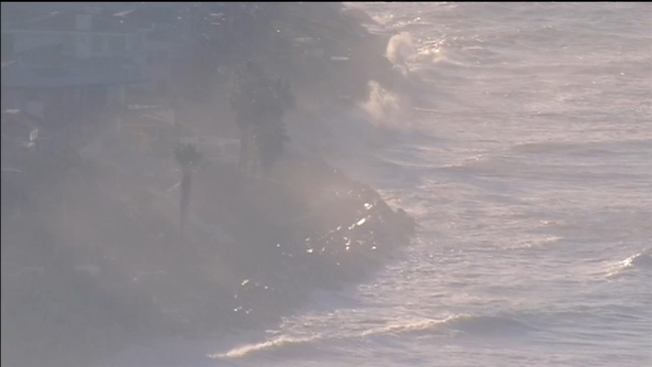 The highest surf is expected south of Del Mar, according to NWS.